The salmon fishing in Sooke is excellent right now! Gord from Foghorn Fishing Charters reports: "Sooke fishing has been good over all, nice fish around and like normal good days and slow days, but the one thing is they are here till Sept and the pinks and sockeye should show up mid July, here is a pic of my clients from Texas John Bledsoe and his 16 year old son Wilson with there first spring salmon, John has a 20lb and his son a 32lb"
Lots of reports posted on sportsfishingbc forum of salmon in Sooke from high teens to mid 20s. 65-85 feet, most common combination is Betsy flasher and teaser 82 feet. Mark P out for a quick Sooke fishing trip today: On the water by 6:00am done by 7:30am. Four fish up to 32+lbs. That's fast and furious fishing action. 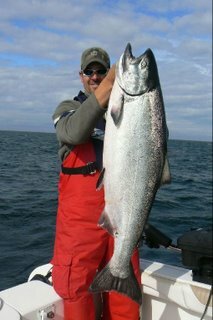 Trevor from No Bananas Fishing Charters is down from Port Renfrew for a week's fishing in Sooke: "salmon fishing in Sooke is unreal, best june I can remember in many years. Yesterday we fished 5am until noon and played 8 fish up to 28lbs. Then this morning we left the dock at 5 agaain and fishing was just as good if not better. We were back at the dock by 10am with 6 fish a 14,24,25,29.5,30,31lbs. What a morning! 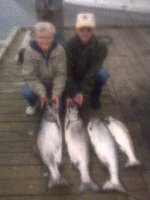 The salmon were caught at Otter point on betsy flasher and bloody nose teaser head, or white glow flasher with green head. Depths 51 and 85 feet." Fishing in the Sooke area continues to be strong with nice catches coming from all the local hot spots. After a good run of calms seas the westerlies returned last week and continued through the weekend limiting fishing to the morning. Saturday seemed to be the hottest day on the water with many anglers returning with limit catches into the 30 lb. range. Fish are being taken from 30’ to 120’ on the rigger, fishing in close to shore or out in the 200’ range. With the Granddaddy of them all the 23rd Annual Juan De Fuca Derby coming up this weekend the poundage should be up considerably from the past few years. One local guide said Chinook fishing hasn’t been this good in six or seven years. It wouldn’t surprise me if the big fish comes from one of Sooke’s many hot spots, just like last year when Joe Kadar nabbed his winner off Secretary Island. Angler’s will be heading out early Saturday morning in search of the winning fish which will net a nice $25,000 first prize with the final weigh-in Sunday at noon at Peddar Bay Marina. Halibut has slowed a bit with the windy weather and the arrival of more Dog fish making catching a nice Hali a bit of a challenge. Crabbing continues to be strong with some really nice keepers. Keep your rod tip up! The Juan de Fuca Derby is this weekend. This high stakes derby is sold out far in advance, most difficult ticket to get in town! It is the traditional kick off to the Sooke summer fishing season. 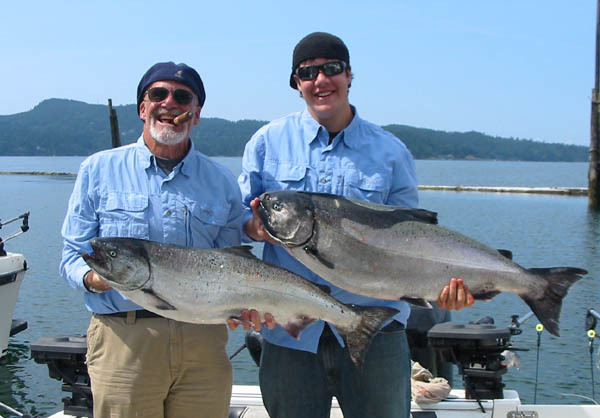 Tickets are now on sale for the Sooke Salmon Enhancement Society (SSES) Derby: July 31-Aug 1, 2009. $50 to enter. A very fun weekend and for a very good cause! Come out and support your local hatchery and have a blast doing it. Now get out there and go fishing!